The Arizona Coyotes have dealt forward Antoine Vermette to the Chicago Blackhawks in exchange for prospect Klas Dahlbeck and a first-round pick. The Arizona Coyotes have dealt forward Antoine Vermette to the Chicago Blackhawks in exchange for prospect Klas Dahlbeck and a 2015 first-round pick. Fresh off a 4-1 loss to the Boston Bruins, the Coyotes posted a video to their twitter account with the 32-year-old's reaction after hearing the news of a pending trade. "On behalf of the entire Coyotes organization I would like to thank Antoine for everything he did for our Club on and off the ice the past four seasons," Coyotes general manager Don Maloney said in a statement. "Antoine is the consummate professional and a class act and we wish him the best of luck in the future." 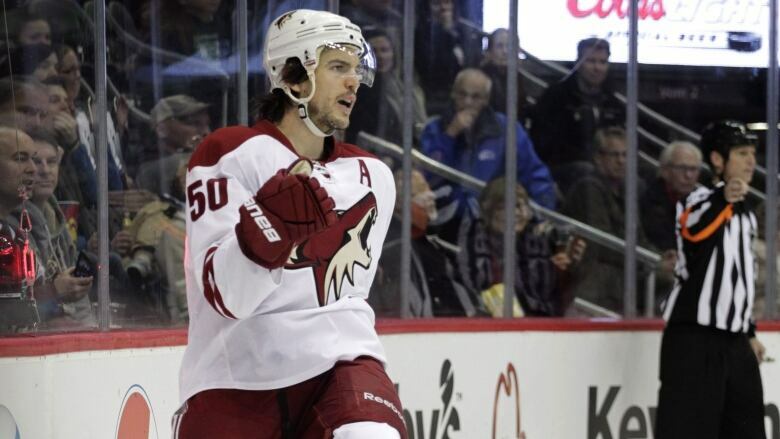 The centreman has 13 goals and 35 points in 63 games played with the Coyotes this season. He also owns the NHL’s second-longest active consecutive games played streak at 456 games. Vermette joined the Coyotes in the 2011-12 season. He previously played for the Columbus Blue Jackets and the Ottawa Senators, who took him in the second round in 2000. The St. Agapit, Que. native will become an unrestricted free agent at the end of the season. The Blackhawks were in need of some help up front as their top-scorer Patrick Kane suffered a season-ending broken clavicle and was placed on the long-term injured reserve earlier in the week. Defenceman Klas Dahlbeck netted one goal in four games with Chicago this season after making his NHL debut on Dec. 6 at Nashville.